Just about a year ago I posted about my experience attending the Art New England program at Bennington College, where I took a Landscape Painting class and oil painted for the first time in almost 30 years. (You can find that post HERE.) I've done a little oil painting in the year since then, but I felt like I was floundering without the guidance of the teacher and the peer group. So this past week, I returned to repeat the experience. We first met with our class and teacher on Sunday evening, and from Monday through Friday, we painted every morning, and every afternoon. And I actually painted a couple of evenings, too. We had a final group critique session on Saturday morning, and headed home. The images in this post are my paintings, and the locations where I painted. The rest of my class was incredibly talented, and it was very humbling. But I don't feel that I have permission to share their work with you here on the blog. Just above are two beautiful locations on the campus, and directly below are the paintings that I created at those locations. Both were done in 3-hour sessions. Last year, I photographed a trio of fire hydrants that had me intrigued, and I had it in my head that this year I would paint them (papa, mama, and baby) at a time of the day that they were casting nice shadows. So I was very disappointed to discover that the trio was gone, and I went on a search to find another interesting hydrant. Here's the hydrants from last year. And here's what I found and painted. There's a partially hidden greenhouse to the right side of the hydrant, and I planned to paint it with the hydrant, but the lighting was wrong, so I chose a different direction. It's a good thing that the triple hydrants were gone, because I absolutely NEVER could have painted three of them in three hours! The structure and therefore the drawing is way too complex. Here's the not-so-finished painting. I still plan to go back into it. I want to bring up the highlights on the hydrant, and add some depth to the negative space. Here's another 3-hour painting done on the campus. We spent a day and a half a the Park McCullough Historic House and the beautiful grounds. I wanted to paint in the garden, but when we got there is was very hot and I decided to find a place with some shade to set up my easel. I saw these horses in a field on a hill (the photo is zoomed in), and decided they'd be fun to paint. The horses were in the lower right of the scene as I was painting it below. The next day I found a lovely little lily pond in the garden, and nestled in to paint. It was more complex than I'd expected, so instead of doing a different painting in the afternoon, I worked on the same painting all day. Here's the location where I was set up. While I was working, I was entertained by a croaking bullfrog. After a while, he sat on a rock by the pond and posed for photos. He's definitely a prince! I was also visited by this lovely Eastern Tiger Swallowtail. What a beauty! My finished painting is at the very top of this post. Well, I'm saying that it is 'finished' for now. I still would like to do some corrections. And maybe add the frog on the rock? I also painted a couple of evenings. Both paintings were done fast, in rapidly changing light, and both will be getting some edits from me in the coming weeks. My biggest challenge of the week was the last painting I did. I went back to the hidden greenhouse that was near the fire hydrant and set up my easel. I worked on the painting for a full day, standing at the easel in the hot sun. Here's the painting as it looks right now. I'd love to drive back to Bennington in the coming week, to keep working on it. I want to bring some detail into the foreground, and also do some more work on the greenhouse. The last morning, we had sort of a critique session. Here's four of my pieces on the wall. It was a super-productive week, and I'm inspired to do more painting, but unfortunately my aging body has not been cooperative. I think standing all day painting the greenhouse on a hot sunny day really did me in. I'm already struggling with spinal degeneration, and having injections for pain management, but since I've been home I've been in tough shape. I'm hoping to resolve it in the coming weeks, because I despise having to curtail my activities because of my spine! Once a year, three of my favorite former colleagues join me at my 'camp' for a henna-on-the-dock date, where we ate lunch on the dock, drank some sparkling pink moscato, shmoozed, and painted ourselves with henna. The group consists of the high school art teacher, the current elementary art teacher (my former job) who was the elementary computer teacher when I was still teaching, and the middle school math teacher who used to be a 4th grade teacher. 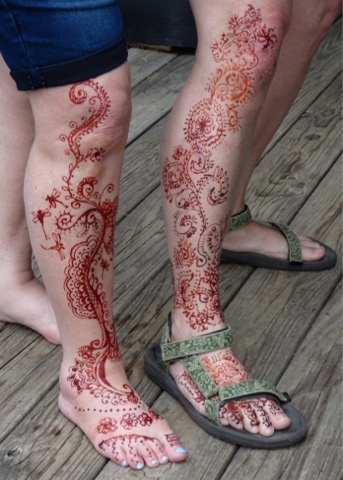 I previously posted about our henna date in 2013, but we've done it every year! You can find the 2013 post by CLICKING HERE. The two photos above are the legs of me and the math teacher. I've told you about her before, and our first experiences with henna, when she was a 4th grade teacher going through chemo for breast cancer. Over the course of that winter seven years ago, I painted henna on her head on three occasions, and it was the best therapy imaginable. You can read more about that by CLICKING HERE. Like any group, we grow and change over the years. The youngest member of the group, the high school art teacher, now has a toddler. 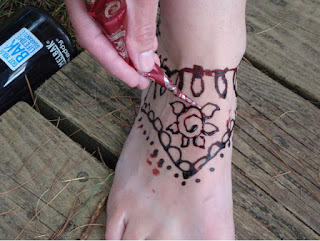 After eating lunch, she painted henna on her ankle, but... after a few smears and her little guy jumping in a muddy puddle, she decided to leave it was safest to leave it as an ankle decoration! I don't blame her. But oh, the little guy, with his head of loopy curls, is SO adorable!! That's her ankle, above. 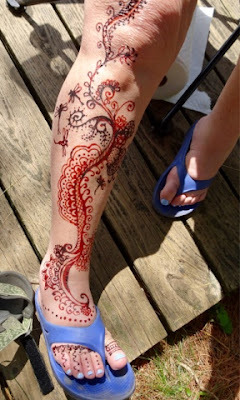 Below is my leg. The two different colors are the difference between the parts that are fresh and the parts that have dried. 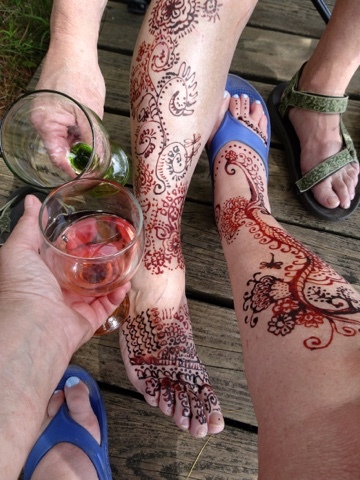 The fourth gal chose not to paint henna at all. 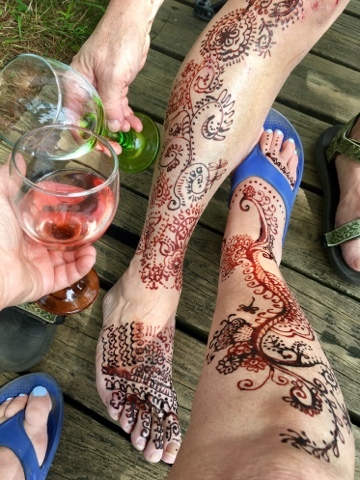 She's only been coming to henna-day for two years, and she's a bit conservative in her 'look' but we were glad we had her there with us to eat lunch in the sunshine and schmooze! Thanks for stopping by!